Ranked by Forbes as the #1 city for education, Boulder, Colorado offers students, entrepreneurs and families a great quality of life with a one-of-a-kind view. Only 30 miles from Denver, the leading metropolis for business and careers in the country, Boulder resides where the Rocky Mountains and Great Plains meet. Known for its beautiful landscapes, the city has over hundreds of outdoor activities from hiking to rafting to even a casual throw of frisbee on University of Colorado’s Farrand Field. With the Flatirons, Boulder’s stunning rock formation, to Chautauqua Park, a strong active lifestyle is ingrained into the culture. Dozens of runs take place all year round from the “Polar Bear Plunge” on New Years at the Boulder Reservoir to the 10km run on Memorial Day named “Bolder Boulder”. 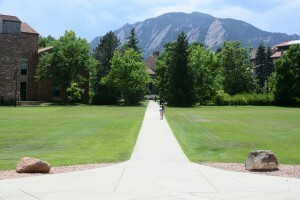 With its high rankings in education, Boulder offers public schools, charter schools, private schools and universities from CU and Naropa. As the state’s largest university, the University of Colorado Boulder is one of the top public colleges in the nation with leading programs in aerospace engineering and physics. From academic studies to social life, the campus resides on the outskirts of downtown along with a series of hiking trails so college here is never boring. It’s impossible not to find an adventure in Boulder. With an ideal climate in a both literal and figurative (business!) sense, there is a reason why entrepreneurs and startups begin in Boulder. While the city gets a reputation for its liberalism and hippie culture, make no mistake that the city itself knows how to conduct business. A reason being is that the frame of mind about work differs from other like cities. There is not the constant hustle and bustle of a bigger city but nevertheless a strong community working to better Boulder as a place of prosperous business. Other companies and individuals are willing to help more in order to improve the way of life in the area. The community is booming with startups from NextHealth Technologies, a healthcare consumer platform that enables health plans to reduce medical costs, to Gnip, the world’s largest and most trusted provider of social media data. There is a generous give and take culture established, which creates successful endeavors for anyone looking to grow or form their business. As a hotbed of business activity from high-tech companies to healthcare apps, Boulder is the place to be. If you are expanding your company or wanting to begin your entrepreneurial journey in Boulder, Halloo can help make your business run efficiently and effectively from the inside out. Find a Boulder, Colorado area phone number for your business. To search numbers available in area code 303 and 720 click here. This entry was posted in Local phone numbers and tagged Boulder Phone Numbers, Toll Free Numbers by Kathryn Anderson. Bookmark the permalink.